We took a break from our national park hunt during the first week in July, deciding to spend the week — including the Fourth of July — visiting and reconnecting with wonderful friends in the small town of Troy, Montana, which included a popular vintage car show as part of the Americana celebrations. It was quite refreshing leaving the trailer and truck parked in the driveway on their property — and be chauffeured around to some of the natural beauty that surrounds Troy. 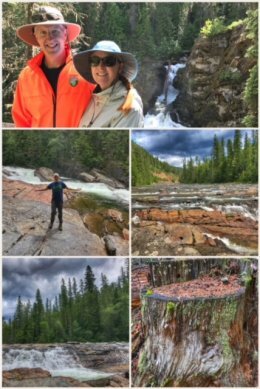 God provides many cathedrals of nature in this part of the U.S.
We visited up in the Yaak River area in the Kootenai National Forest, including the Northwest Peaks Scenic Area — where a thunderstorm with graupel kept us from hiking one trail. 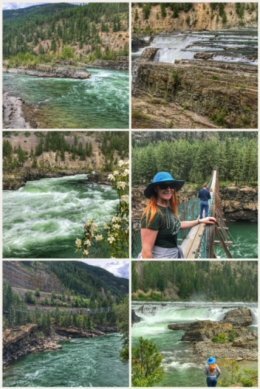 We also revisited Kootenai Falls — which Jen and Ran had both visited on separate occasions in years past — but did together this time. The falls, one of the largest free-flowing waterfalls in the northwest, are located on the Kootenai River, and easily accessed from a trailhead along U.S. Highway 2, near Libby, MT. The falls and surrounding area are considered sacred to the Kootenai Indians whose ancestors inhabited the region. We also loved that the Civilian Conservation Corps (CCC) built roads and bridges in the area — including the first swinging bridge over the river. The falls and the fast-moving river are certainly the natural highlights, but for the strong of heart — consider a walk across the current swinging bridge. And for train-lovers, if you’re lucky, you’ll get to see a train pass below you as you stand on an overpass you need to hike to get to the falls and back. 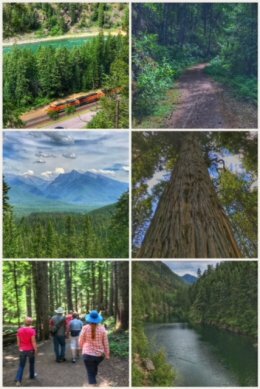 We also recommend the Old Highway 2 Trail, which takes you along a cliffside hike up the old roadway, high above Kootenai Falls. The views are stunning and the nature abundant — including some ripe thimbleberries to munch on as we hiked… but the truly amazing part is to imagine that cars used to travel this narrow mountain road before the highway was built below. We ended our peaceful visit with a hike to Ross Creek Cedars Natural Area, a grove of western red cedars, some of which are more than 400 years old and 8 feet in diameter, meeting up with some additional friends and family. It was wonderful to be in a forest with these ancient giants — something we had missed since our days on the California and Oregon coast and the giant Sequoias. You can hike a fairly easy 1-mile nature trail, as well as explore deeper into the forest. Our advice? You must add this area to your list of places to visit –a perfect stop before or after Glacier National Park. This visit will certainly be a highlight for us — not only for the peace and calming of northwest Montana, but because of the amazing company of our gracious hosts. But before we get back to our hunt — and Glacier National Park — we need to share exciting news that has been simmering in the background for the last few weeks… but that’s the subject of the next post, so please keep reading! Next Post:Stop 37: We Beat Amazon in Finding our New Headquarters!